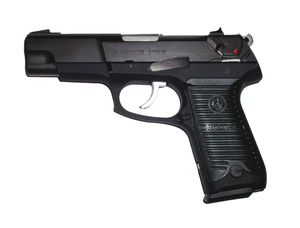 The Ruger P89 semi auto pistol is one of the "P" series developed by Ruger with the series still in production today. Specifically, the P89 is an upgrade of the P85 which was discontinued in 1992. The P89 is a rugged, strong, all metal 9mm handgun that is heavy and blocky. The gun sports a safety or decocker according to whether it is the double action only or DA/SA model. I have two friends that have the P series pistols and I've had a good deal of experience shooting them. In several firing sessions, one of my friends' P series Ruger had failure to feed issues and jammed repeatedly. The other has one that has performed flawlessly and is a tack driver. Written reports from civilian users and police officers are generally quite favorable toward the P89. The gun is easy and quick to take down and assemble. Many of these guns have been in use for quite a few years and are a workhorse for casual shooters, law enforcement and civilians who carry guns for self defense. If you do enough research on these guns you begin to get a sense of the durability of the gun from dependable reviews and owners. Reports from people who have owned the guns for years and put countless thousands of rounds through them report the very used guns perform as they did when new. Though they have been discontinued for a few years, used models are quite abundant and found in a lot of gun shops across the country generally for a very reasonable price. However, before buying a used one, give it a good looking over. Many of the used ones have endured thousands of rounds. Make sure the one you put down money for has been well cared for. The Ruger P89 weighs 32 ounces, has a 4.5 inch barrel, and comes with a 10 or 15 round magazine, and sports 3 white dot sights. Sorry for the short duration of this particular article on the Ruger p89 but there is not much more about this model other than what I've written. The Ruger P89 was discontinued in 2007. Ruger now makes a P95 that is the current version of this firearm. Working with these guns didn't add much to my experience with a P series .45 I had a few years before this review. It was a deplorable disgrace of a gun. Performance was almost non-existent with repeated failures. That was with any kind of factory ammo tried. But I digress.